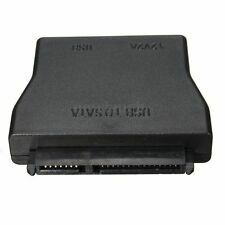 * 44-Pin Male IDE To SD Card Adapter * The 44-Pin Male IDE To SD Card Adapter is transparent to the operating system and does not require any drivers. 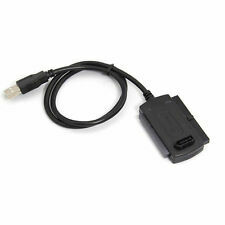 * With this adapter, the host PC will identify the inserted SD card as a standard IDE hard disk. * As such, you can install any operating systems and the SD card will be bootable . * It power from 44-Pin IDE interface. * Hot-swappable . * Converts Secure Digital Card into IDE compatible hard drives. * Bootable solution for laptop computer . * Power from IDE interface . * You can install the OS onto the SD Card . * No hard disk noise from your workstation . * Compatible with MMC system specification 2.0 , SD Memory Card specification 1.0 , SDHC Memory Card . * Compatible with DOS, Linux, Windows 98SE, Me, 2. Connector : IDE 40Pin, IDE 4Pin. Card Support : SD SDHC SDXC MMC. 1 x PCIE 3.0 X16 Adapter. Output interface: PCIE X16/X4. Support Slot: PCIE X16/X4. Support system: Windows 8 / 10 / Linux. Straight to Right Angled connectors with locking clip for secure connection. Compatible with SATA I and SATA II hard drives and mother boards. will also connect SATA II Hard Drtive to SATA I Motherboard and Vice versa (speed dictated by slowest). 2013-2014 version MacBook Air A1465 A1466(MD711 MD712 MD760 MD761). 2015 version MacBook Air A1465 A1466(MJVM2 MJVP2 MJVE2 MJVG2). • 2012 version MacBook Air SSD is 7 17 pin, size is 109 mm 24 mm.2012 version MacBook Pro SSD is 7 17 pin, size is 89 mm 33 mm.It's SATA interface. 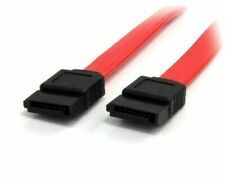 Condition: NewType:Adapter/ConverterConnector A:Mini SAS SFF-8087 Malematerial: ABScolor:Black and WhiteMINI SAS 36P TO 4 SATA,support 10gbps band Cable length :1MItem sold as pictured. No other accessories are included in this listing.This item is BRAND NEW, NEVER USED.SpecificationsCompatible Products:Adaptec RAID 5405Adaptec RAID 5805Adaptec RAID 2405Adaptec RAID 51245Adaptec RAID 51645Adaptec RAID 52445Adaptec RAID 5405ZAdaptec RAID 5445Adaptec RAID 5445ZAdaptec RAID 5805ZAdaptec RAID 31205Adaptec RAID 31605Adaptec RAID 3405Adaptec RAID 3805Adaptec RAID 1405Package Included:1 x Data transmission cableNote: Light shooting and different displays may cause the color of the item in the picture a little different from the real thing. The measurement allowed er. Only for 2.5″ SATA and SSD HDD. It does not support 3.5″ SATA Hard Disk Drive or 3.5″ Desk HDD. Compatible with 2.5″ SATA1, 2.5″ SATA2 Hard Disc Drive and SATA SSD. 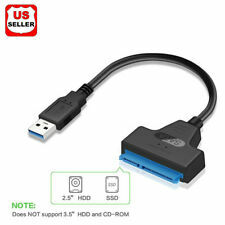 Connects 2.5″ 7 15pin SATA HDD/SSD to the computer via USB port for easy test and data transfer. 100% New and high qualityQuantity: 1Makes SD/MMC flash memory card be a super compact, cost efficient, anti-shock, low power consumption, no acoustic noise and fast access time HDD.Enables IT engineers and embedded technology enthusiasts to use SD/MMC card as a normal IDE 2.5" hard disk.Provides an alternative for data storage and transfer or test for motherboard, sound/audio/memory card, etc.Ideal for some devices that required a fast and easy bootable device such as POS.Be a SD/MMC card reader/writer.Compatible for SD, SDHC, SDXC & MMC specification.One 2.5" IDE hard disk driver 44pin male connector and one standard SD socket.Supports PIO, Multi-Word DMA and Ultra DMA data transfer mode.Supports boot function.No external power required and powered from IDE. SATA revision 3 doubles the speed of the current 3GB/s version reaching transfer speeds of 6GBs. 7 Pin SATA data. Locking male connectors. Right angle for those hard to reach tight spaces. FLAT cable. With the Bidirectional SATA IDE Converter, you could convert from IDE to SATA or SATA to IDE. SATA slot is now available even if your motherboard does not have any SATA slot. Compliant with Serial ATA Specification. Compatible with Ultra ATA 100/133. With red LED indicator light. Size:5.4 x 4.5 x 0.7cm/ 2.1" x 1.7" x 0.3"(L*W*T) Color:Red,Black Brand Unbranded MPN Does not apply UPC 4894462484920 EAN 4894462484920 ISBN 4894462484920 Designer/Brand Unbranded UPC 4894462484920 EAN 4894462484920 ISBN 4894462484920. Length: 45cm. Serial ATA / SATA II Hard Drive Data Cable. Straight connectors with locking clip for secure connection. Compatible with SATA I II &III hard drives and mother boards. Length: 90cm. Connection: SATA data 7pin to 7pin. Colour: Black. Longueur câble prises = 50cm. Compatible SATA 1 et 2. 6 Gb/s Max en SATA 3.0. 3 Gb/s Max en SATA 2.0. 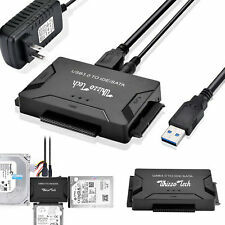 MSATA SSD to 2.5" SATA Convertor Adapter Card. The item is a mSATA SSD to 2.5" SATA Convertor Adapter Card. Iterfation: mSATA SSD to 2.5" SATA. Support SSD size: 50mm x 30mm. Supports Windows2000/XP/7/8/10, Vista Linux Mac 10 OS. 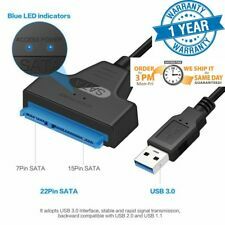 Condition: NewType:Adapter/ConverterConnector A:Mini SAS SFF-8087 Malecolor:black&bluematerial: ABSMini-SAS SFF-8087 to 4 SATA 7P 90 degrees Cable 100CMMINI SAS 36P TO 4 SATA,support 10gbps bandItem sold as pictured. No other accessories are included in this listing.This item is BRAND NEW, NEVER USED.SpecificationsCompatible Products:Adaptec RAID 5405 Adaptec RAID 5805 Adaptec RAID 2405 Adaptec RAID 51245 Adaptec RAID 51645 Adaptec RAID 52445 Adaptec RAID 5405Z Adaptec RAID 5445 Adaptec RAID 5445Z Adaptec RAID 5805Z Adaptec RAID 31205 Adaptec RAID 31605 Adaptec RAID 3405 Adaptec RAID 3805 Adaptec RAID 1405Package Included:1 x Data transmission cableNote: Light shooting and different displays may cause the color of the item in the picture a little different fr. Possibilité d'envoi suivie lettre suivie. Expédition rapide. Connector A: 15pin SATA Male connector. 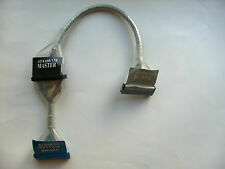 SATA to 4-Pin Molex for connection to legacy optical drives. Connector B: 2x4pin Molex Female connector. 15 CM SATA 15 Pin Power to Dual 4 Pin Molex Power. Length: 15cm. 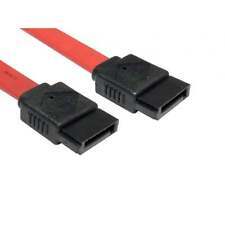 Lot de2 Cables SATA 3 ASUS. compatible SATA 1, 2 et 3. Longueur: 40 cm. 44-Pin IDE Female to 22 Pin Male SATA Adapter Specifications: Supports IDE 66/100/133MB/s No additional power supply needed. No driver needed. Plug and play device Unit is not hot swappable. Convert your older 2.5"IDE HDD to a 2.5" SATA HDD. Dimensions: 2.72" x 0.55" x 0.69" (L 69mm x D 14mm x H 17mm ) Package includes: 1 x 44Pin IDE HDD/SSD to 2.5" 3.5" SATA Adapter Brand Unbranded MPN Does not apply UPC 6902697905801 EAN Does not apply EAN Does not apply. Support ata 100/133 1 X IDE to SATA adapter 100% new Brand Unbranded MPN Does not apply UPC 4894462167311 EAN 4894462167311 ISBN 4894462167311 Designer/Brand Unbranded UPC 4894462167311 EAN 4894462167311 ISBN 4894462167311. The adapter card can't identify if your M.2 NGFF hard disk interface only support SATA AHCI mode! 2012 version MacBook Air SSD is 7 17 pin, size is 109 mm 24 mm.2012 version MacBook Pro SSD is 7 17 pin, size is 89 mm 33 mm.It's SATA interface. 44 Pin 2.5" IDE male to male gender changer or adapters with female sockets. Gender Changer. For 2.5" IDE HDD. End 1: 44 Pin IDE Plug. End 2: 44 Pin IDE Plug. Length: Adaptor. It will not fit the mid 2013 onwards models of A1465, A1466 with 12 16 PCIe based SSD. Macbook: A1465 MD223 MD224. A1466 MD231 MD232. ONLY support MacBook ORIGINAL SSD (2012 Year). DO NOT insert 2010/2011 macbook air SSD. 1x MOLEX 4pin mâle -vers->1x 3pin mâle. Sandisk SDSA5JK ADATA XM11 UX21 UX31 TAICHI21/31 SSD. 1 x SDSA5JK ADATA XM11 xm11zzb5 SATA Adapter. For Sandisk U100 Series & compatible Storage: SDSA5JK-256G, SDSA5JK-128G, SDSA5JK-064G. No need extra power adapter and any drivers. Câble Adaptateur 4 Pin (MOLEX) IDE vers 2 SATA. 39 avenue du pont juvénal. Pour éviter de perdre ou voler,sélectionnez Lettre suivi ou mondial relay. BIC: AGRIFRPP835. FR76 1350 6100 0085 1131 9008 194. For APPLE MacBook AIR A1370 A1369 MC503 MC504 MC505 MC506. For APPLE MacBook AIR A1370 A1369 MC968 MC969 MC965 MC966. The PCBA can convert for Macbook Air SSD to Standard 22 Pin SATA port. 1pc SATA to Macbook SSD Adapter. Condition: NewConnector A:SFF-8087 Malematerial: ABScolor:BlackSerial Attached SCSI (SAS) is a high-speed data storage interface designed for high-throughput and fast data access. Intended primarily for data storage centers the SAS interface is backwards compatible with SATA. This allows the user to mix more expensive lower-capacity SAS drives for applications that require faster data access and higher reliability with lower-cost higher-capacity SATA drives for applications with lower access speed requirements. 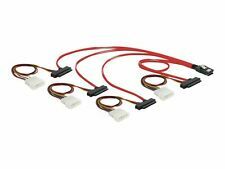 This Cable uses 28 AWG wires and is intended for internal use. It has a single 36-pin SFF-8087 male Mini-SAS plug on one end and a single 32-pin SFF-8484 female SAS connector on the other end. Note: As with all cables using SFF-8484 connectors this cab. (Only compatible with the NGFF SSD of the sata protocol. NEW SATA to M2 NGFF SSD Converter Adapter Card M.2 to. AD905A SATA III to M.2(NGFF) Storage adapter, providing one 7 15pin connector on the host connection and one 67pin B key M.2 connector on the SSD storage devices connections. ). Tight pitch 7 position connectors save space compared to larger parallel ATA connectors. Right angle connector reduces cable strain for applications requiring a 90 degree bend. Serial ATA cables are replacing wide Parallel ATA ribbon cables in many applications. 3.3 Volt Mini PCI-e SSD (mSATA Module) Support. 1 x mSATA SSD to Micro SATA Adapter. NOTE: Not compatible with 50mm Mini PCI-e SATA SSD & PATA. Fully compliant with 1.8" micro SATA specification. Mini PCI-e 52 pin Connector. Pleae make sure the M.2 NGFF port of computer supports PCIe X4 or PCIe X2 transfer mode(The speed of SSD can reduce 50% if M.2 NGFF SSD port only supports PCIe X2 transfer mode)! 1 x M.2 NGFF X4 adapter card. Straight connectors with locking clip for secure connection. Compatible with SATA I II &III hard drives and mother boards. Length: 45cm. Connection: SATA data 7pin to 7pin. Colour: Black. SKU : 006548. SATA revision 3 doubles the speed of the current 3GB/s version reaching transfer speeds of 6GBs. 7 Pin SATA data. Locking male connectors. Right angle for those hard to reach tight spaces. 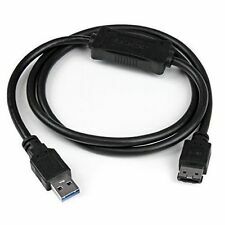 This is a SATA extension cable with a male connection and female connection. It has both the 15 pin power connector and 7 pin data connector built in to the one unit making it a simpler solution than two separate cables. 1 x CF to Zif 1.8" HDD SSD Adapter. 50-Pin standard compact flash socket. 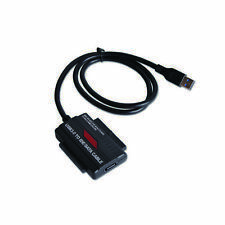 Compatible with Compact Flash Type I, Type II, and support IBM Micro-drive with CF-II interface. Supports DMA and Ultra DMA modes. 15pin SATA Power plugs 4pin male to Molex Female. 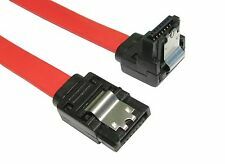 This Adapter Changes a standard SATA power Connector into a standard molex. 1x Molex to Serial ATA Power Adapter. 4 Pin female molex. 15 pin male SATA power.